You'll notice a new ViewRanger update (V2.0.0) is now available to download from the Apple appstore. This update refines and tidys some of the connectivity, that was introduced in the previous release, between the app and the new my.viewranger.com online community and trip planning website - including tidying some areas around account creation and sign in. You'll also find that recorded tracks that now ordered more logically within the app, with newly recorded tracks listed at the top. 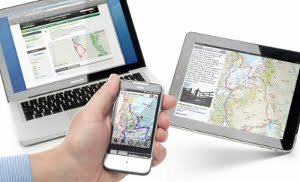 At the same time, we have added new in-app regional map products for France and for Northern Ireland. These provide a simple and quick way to purchase and download common recreational areas.